Last Christmas (2006) while visiting relatives in Canberra, I had a chance to visit the Canberra Bicycle Museum several times <canberrabicyclemuseum.com.au>. It has a great library and resource center, not to mention a whole bunch of very interesting historic and modern bikes. 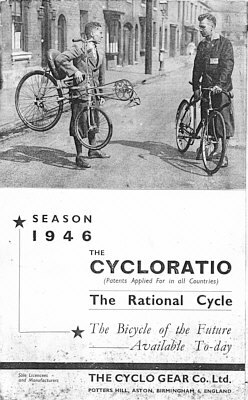 While flicking through a large hanging file on recumbents, I came across this original 1946 Cycloratio brochure. So I made a photocopy, scanned it, and have reproduced the text and prints here. Aside from being a blast from the past, the thing that struck me most about the Cycloratio was the simplicity and elegance of its design. The straight chainline, the high seat, the front cranks well clear of the front wheel -- obviously the seat angle is a bit upright for my taste -- but the frame is fully triangulated. This would be much simpler to fabricate than a modern M5 or Optima tubular frame, so I decided to have a go. What follows is my account of this project. To start with I took one of the photographs from the brochure and warped the perspective so as to get the frame geometry as square as possible to the page (I used the line of the curb and brick wall as a reference). Then I scaled the photo so the 28" rear tire was 28mm on the vector graphics page, then I traced the frame and added some dimensions. The scale is 1mm to1", so for example a 3.15cm shown above is 31.5". This will give me a rough starting point from which to draft a set of plans. In the brochure they say the Cycloratio has a 22" front and 28" rear, but the proportions as traced indicate front rim as photographed is actually 20". Seat Type: the should be replaced with either a mesh seat, or a solid carbon fiber seat. 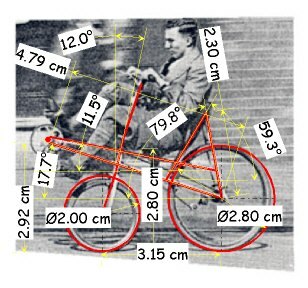 Seat Height: I would rather something closer to 500mm as long as it doesn't compromise the chainline. BB Height: This should be 150mm higher than the seat height. Rear Wheel: I will probably change this to a 26" rim, because they are easier to come by.